So, I'm going to Mexico at the end of June with my church to build a house. Since I am going, I need to renew / get a new Passport. 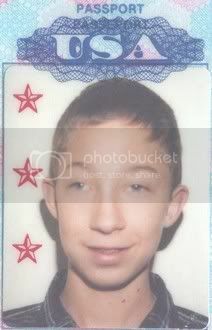 Well, since I can still use my old passport to help the renewal process, I had to dig it out, and man was I young. This was back in 1998, and I was in 8th grade. I can still not get over how much I look like a baby in this picture. So, last night, Nita, Jon, Kara, Brain, Chris and I all went and saw "The Hitchhikers Guide to the Galaxy", which was a really great movie, and I think I might have to read the book now. I know some of you who have read the book, might disagree with me, but I liked it, and thought everything was well done. Also, I really hate to say this, but I think that was the first movie I have seen in a theater since "National Treasure", back at New Years in Columbus, Oh with my sister when I was up there visiting her. Also, right now I'm in the middle of rebuilding one of the test servers. My idea did work, the only flaw was that the computer I setup to try it on ran out of hard disk space. I did not use the first test server I setup, because I did not want to loose the 6.0 install incase this did not work. So, yesterday afternoon I ran up to CompUSA, and got a new 160GB hard disk for the computer, and another 128 of RAM for it also. I really like working for a company that, if I need to pick something up, I can just run out and get it, and not have to worry about it. That is also why I like company accounts is I don't have to worry about how to pay for it also. Besides, CompUSA gives company accounts a good discount. So, right now its running the script to and in all the tables and everything that is needed for Wennsoft "Job Cost" & "Service Manger" to run. Once I get it going on the historical company’s (cus it will take a few hours), I'm going to head out to lunch, and get my hair cut and grab something to eat. This morning we had our monthly company breakfast and that was good. I do love working for CAC, they are a great bunch of people who really crack me up. Laura, who works in our front office, cracks me up a lot, and is also the mother of Brain, who went with us to see the movie, anyway, the sink got clogged cus she was trying to dispose of & clean the pot that had Red Chile in, and so I had to get the plunger out for her, and she made the comment that it look liked someone had there period in the sink. Well, lets just say the whole office was in stitches over the comment, and Carl was like, "That’s it, I get to go home now, cus I did not need to hear that" lol. It was a great way to end a stressful week. Well, that is it for now. Tonight I'm going to see the Isotopes (our local AAA baseball team) play cus its Lutheran night at the ballpark, so that should be lots of fun. Plus, I have heard that this year, we have really good seats, so that should be cool. I just hope they win, cus that would be awesome. Also, I got the icon from lil_soleil. So Liz, I hope you dont mind me using it, cus it is just great! As far as your installations go, have you ever tried Virtualized Servers using MS Virtual Server? It's a pretty cool platform for doing testing on. Basically, you can create bunches of VPCs on a server, and install OSs on each of those, and then install software you're trying to test. It's kinda handy since if one gets messed up, it's pretty easy to blow away. The other nice thing is that you can set up a base server VPC once, and then supposedly create copies of it for testing purposes. I mainly use it for my personal colocation box. The box has something wrong with it and Linux crashes because of it, so I have Windows Server installed and Linux running inside a Virtual Server on top of it. If there's no other reason to use it, it just makes you feel like a powernerd(tm). Personal, I love the name, and think its cool. Most people like it, but there are a few that are like "I don’t know why we just can not be The Dukes again". But, they are a good team, and fun to watch. As for the MS Virtual Server thing. For us it’s just not practical. We use a software package called "Microsoft Business Solutions-Great Plains", which is a very picky software, which is why I call it "Great Pains". Ours runs on a SQL Server 2000 backbone. But it does sound very cool, and I will look into it. The only reason why I have test servers up and running right now is we are getting ready to go from version 7.5 to 8.0. With Great Plains, doing an upgrade is not easy, and has lots of errors along the way, so we like to get a test server or two up and running with the same exact OS, service packs, and all the other fun stuff as our server. That way we can mimic any problems that we might have with the upgrade, and figure out fixes for them before we go live with the software. The person I replaced in this job told me that most company’s that run "Great Pains" have a whole IT department just for this software package. Well, I am the whole IT department. LOL. Well, now that I have rambled on enough, I will shut up. I've actually never heard of Great Plains, surprisingly. I'll have to read up on it. I'm 50% developer, 50% it dude here, maintaining the Windows domain, the Exchange server, the Live Communication Server, the ISA server, and a few other things, but my main focus is on development. We have a full-time IT guy, and he takes care of just about everything else, and does a phenomenal job on it. No need to shut up. I don't know many other young professional folks, so it's always interesting to me to hear how life is at their workplace. I hope you've seen the movie "Officespace". If not, I highly recommend it! Oh yeah, I live about 40 miles outside of Boston. HEHE, Yes, Officespace. That was like totally my old office. Our version of the “TSP Reports” were “Foodservice Equipment Schedule”, which had about 500 line items on it, and was just a very large spreadsheet that we did in Excel. We had to print that on paper that was 24” by 36”. I used to design Commercial Kitchens for Restaurants, Casinos, & Hotels. But, my boss I swear had the male version of PMS. He would yell at us for now reason, and we were not a large company, so I took it very personal. I worked for him just a little under 3 years. It’s really funny, cus I said to my self, I really need to start looking for another job, when a friend of mine was like "Hey Kevin, my moms company is about to loose there systems admin, and I don’t know if you are interested or not?" so, I called my now boss, and scheduled an interview, and the next day they offered me the job. I was going to turn it down, cus I was very scared of Great Plains, but what Dennis (my boss) told me is that they keep a company on retainer if we need them, and if we have to use them, then we have to use them. Also, Great Plains is better then I thought it was going to be, and I have been going to some good training classes, so it’s working out well. Funny thing is I have been a "young professional" since my junior year in High School. I went down to my old Elementary school one day to see all my former teachers, and the principal (who is a close friend), and I happen to mention that I noticed there website was off line. So, Bea (the principal), then said, well, if you would like, we just lost our guy who used to take care of that stuff, and we cant pay you, but we can bribe you with food. So, I did that working as there Technology Administrator on Mondays, Wednesday, & Fridays after school. I took them from an old 486 running windows 98 that was there file server and general everything server to a brand new Windows 2000 server. As it turns out that was there old web server, but no one there knew Linux, so they formatted it. Also during that time, we went from a very slow 128 ISDN line, to a full T-1. Also during that time, I worked for another Elementary school in town, where my former Third Grade teacher was the new principal. We saw here one night at a restaurant, and she was like “Kevin, I need help with our computers and network”, so I started doing that for them Tuesdays & Thursdays. I did both jobs for about two years until I graduated from High School, which is when I got the job above working for the Commercial Kitchen Firm. I work at a small company as well -- only 11 people. I've actually never worked at a bigger company before in my life, unless you count when I was a Teaching Assistant in College. I absolutely love the small company environment, but I do have the same problem you have with my boss sometimes being a bit...overbearing. I get very frustrated when people resolve their personal problems by taking it out on other people. He's a really nice guy and all, he's just not fun to be around when he's in a bad mood. I suppose your post above definitely indicates the difference in our age :) I'm 25, incidentally. When I was in high school, we had a minicomputer (as in the next step down from a mainframe), with terminals scattered about the building. The CS lab consisted of about 20 dumb terminals connected to said minicomputer. They upgraded us to 486's during high school, and at that point, we just thought it was the greatest thing ever. It was like "HOLY COW! 486 DX4/100's! OMFG!" Quote of the moment: "PC Load Letter? WTF does that mean!?" Thank god for the weekend. Next week ought too be nice though.. 4 people from the company I work at are going to a trade show in Chicago, so the office will be pretty sparse and pretty quiet. I'm hoping I can catch up on some stuff I'm behind in, while not overworking myself at the same time. It was a really good movie. I would write more, but its almost 2am, and I really should get some sleep.